With limited receptacles onboard, charging handheld devices like tablets and smartphones can be a challenge, especially when it requires unplugging onboard equipment to accommodate them. Hubbell Marine USB Charging Receptacles eliminate the need for adapter plugs, while maintaining traditional duplex electrical outlets. Two new configurations work with the latest Type C electronics connectors. Hubbell USB Charging Receptacles come in three versions to accommodate a wide range of devices. Type C models provide two compact USB-C ports for newer portable electronics, while Type A models have two traditional USB ports. For even greater versatility, a combination Type A&C model offers one port of each type. Each delivers a high power output of 5 amps/5 volts to quickly charge multiple devices at once. All Hubbell Marine USB Charging Receptacles use heavy-duty stainless steel USB ports rated for 10,000 cord insertions and removals. 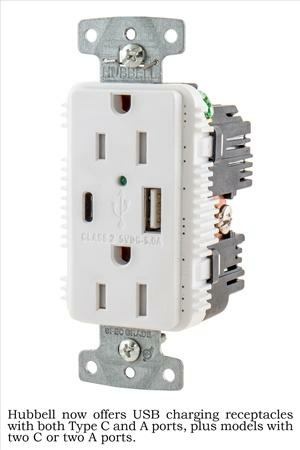 Three-prong electrical outlet connections use cam-action shifters with a friction-free design for effortless plug insertion and removal. Available in black, brown, gray, ivory, light almond or white to fit any type of yacht décor, Hubbell Marine USB Charging Receptacles provide faster charging times and greater convenience in a compact, discreet design. Suggested retail prices start at $44.95. Lowrance released its latest VHF radio, Link-9, designed as a replacement for the current Link-8.